Hallmark Trip 5/8/12 + coupon! 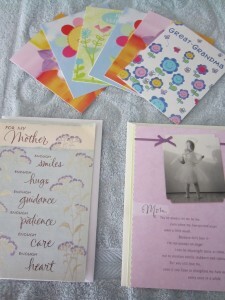 I went to Hallmark today to stock up on a few Mother’s Day cards and use my $2 Crown Rewards. 🙂 Did you know you can combine Crown Rewards and Hallmark coupons?? I was able to get 8 cards for $6.76 after using this printable $5 off $10 Hallmark coupon + my $2 in rewards money!! I saved $7, making this trip savings of 51%! *Hurry, the coupon expires 5/13!